I have a secret to tell you. 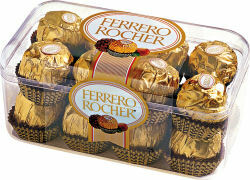 I have NEVER tried Ferrero chocolate. Nope. I know! It’s crazy! I must be the only one! Ohhh I’ve seen them on the shelves at the stores. They look back at me, tempting me with their big, bright shiny wrappers. I have another secret. I’m not a great big fan of chocolate, either. (Yes, I am a woman!) I just don’t ferociously crave chocolate like so many of my gender do. I don’t know why. The “death by chocolate” craze just never appealed to me. But don’t get me wrong– I DO love chocolate and I do eat it when offered! I just don’t think, eat, and breathe chocolate. If you haven’t heard, Ferrero chocolates is donating money to the Share Our Strength organization, an organization that helps feed hungry children in the United States. Ferrero has something going on at their website (see here), where you can help donate to the hungry, too. It’s the Share Something Sweet program– send a customizable e-card (it’s free!) and Ferrero will donate $1 for each card sent, up to $10,000. And if you join the Ferrero Facebook page (see here), then Ferrero will donate another $1 to Share Our Strength (up to $1,000)! How is that for really neat! I donate to the food banks in the area, I hope you do, too– and this is another very easy way to help people in need. I think it’s a very worthy cause. Please consider it, especially as winter weather and the holidays arrive. By the way, the Ferrero website has a nifty chocolate personality quiz here. Of course I tried it! You have a tendency to be drawn to all things elegant, modern and tasteful. Your sophisticated palate desires the complexity and rich, velvety dark chocolate of Rondnoir™ dark chocolates. You fancy culture and refinement infused with a little excitement along the way. And you know the real fun only starts after dark! Anyway, this is a good cause, and it’s EASY to do. Please consider helping the needy! Thanks! P.S. I found this fact at Ferrero’s Facebook site: The amount of ROCHER® produced in 1 week would cover the area of 16 football fields. lol! P.S.S. This is not a paid post! I thought my chocoholic friends might like to know about this to help justify their addiction, lol! ← How Is Your Story-Telling Ability? I love those chocolates, but as I am now on a diet I will not be tempted.. I won’t I won’t I won’t!